Advance reservations are accepted for 3 hour or 6 hour rentals leaving BEFORE NOON. We only accept advance reservations for a small portion of our fleet. All other rentals are all provided on a walk in first come, first served basis. You must arrive 30 minutes prior to your reservation hour to fill out necessary paperwork & training to guarantee your full cruising time. You must watch the Lake George Boating Safety Video at our rental booth, prior to rental. Additional Security Deposit of $300 is collected on all boats on day of rental, prior to leaving the dock. Security may be left in cash or credit card (MASTERCARD or VISA). Boats are inspected before leaving the dock and upon return. You are expected to return the boat in the same condition. Deposits will be returned LESS repair costs of any damage or LESS replacement value of any missing equipment or LESS any necessary cleaning fees. Renter is responsible for all damages above & beyond the $300 security deposit. Any major damage to the boat or motor WILL EXCEED $300. Rental deposit ($200) is a down payment on the boat rental fee. Security deposit ($300) is additional and held to cover any damage to the equipment. Propeller is inspected and shown to renter before & after rental. Any damage whatsoever to the propeller will result in loss of security deposit. Insurance is not offered. Renter is solely responsible for any damage to boat, motor & equipment as well as any injury to self or passengers. No cash refunds will be given for inclement weather, boats returned early or mechanical failure. Time Credits only will be offered. Rental deposit is non-refundable if cancelled within 14 days of reservation. Cancellations made in advance of 14 days, will incur a $50 cancellation fee. No advance notice or a “no show” will be charged the full rental fee on day of reservation. We have built a reputation for exceptional customer service and have developed a friendly, helpful staff to serve you. Boat rentals on Lake George have been the family business since the 1960s. We are happy about this!! Stay Tuned for our update on our Opening date . We have 10 new boats in the fleet so visit www.lgboatrental.com for info on our 3&6 hour rental reservations. Here is the latest News and Weather from Lake George. The ice is on its way out and we are getting our fleet of 35 boats ready to go in the water. Are you planning a trip to LAKE GEORGE this summer? We are excited to offer online reservations for 3 & 6 hour rentals. 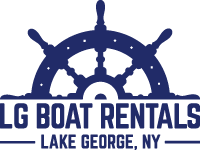 Please follow the link to lgboatrental.com and select reservations and before you know it, you will be on the water.